On a late Thursday afternoon in August, my husband arrived home from work and excitedly said, “You have to come out front and see the double rainbow – it’s stunning!” I picked up our little boy and rushed outside to see the mystical wonder that glittered through the raindrops of the Arizona sky. When I turned to go back inside, I noticed an Orthodox Jewish man on a cellphone standing outside our neighbour’s house, which is an Airbnb. Every few days, a new group of people arrives, but this time I walked over and introduced myself. He told me that 10 yeshivah boys from all over the United States and Canada were staying in the house for two weeks on a summer trip to see Scottsdale and explore Arizona. I told him I was a travel writer and would be happy to help with any suggestions on what to see, where to go, where the kosher restaurants were located and about the local synagogues. The conversation then turned to kosher restaurants that are nearby. One is Milk and Honey, located inside the Jewish community centre, which boasts food like chipotle salmon wraps, kale tacos and shakshuka. The other kosher restaurant is Kitchen 18, which has an eclectic menu, from Israeli food to Chinese to sushi. My new neighbours had done their research and had also koshered their kitchen, so they were ready to explore their beautiful new surroundings that I call home. Chaim, who was from Toronto, was the ringleader, otherwise known as the organizer of the group, so he told me about some of their travel plans. Every other night or so, we got a report about their activities as we bumped into them outside their home of the next two weeks. Scottsdale is known for its outdoor activities and one fun hike is Camelback Mountain, where the views are phenomenal. There are two trails, one is shorter and more vigorous, and the other is longer but not as steep. After a few-hour walk, locals and tourists alike often head to downtown Scottsdale to indulge at one of the many breakfast places, as well as to stroll around. The Scottsdale Civic Centre is a park filled with fountains and is close to the Scottsdale Centre for the Performing Arts, which has a great gift store. Pop into the library, too, just to see the architecture, buy a book or have a coffee in their café. Nearby is one of my favourite casual restaurants, called AZ88. Often in the winter months, there are international festivals in the park across the way. Scottsdale has the most gorgeous winter weather and also provides engaging activities for families. A perfect place for a picnic, especially with young kids, is McCormick-Stillman Railroad Park. Visitors can ride the 1950s-vintage Allan Herschell carousel and then jump on the mini-train and ride around the park. There is also a 10,000-square-foot model railroad building where trains zip around. Check out the museum, which houses the Roald Amundsen Pullman Car, best known for being used by every president from Herbert Hoover through Dwight Eisenhower. For more active adventure, iFLY allows you to experience skydiving without actually jumping out of a plane at 12,000 feet. I call it “reverse skydiving” because you don’t jump down, you start standing as opposed to falling. The new facility is state-of-the-art and it has activities for the whole family. For the tamer at heart, all in one complex are Butterfly Wonderland, OdySea Aquarium and Dolphinaris, where people can swim with dolphins. Butterfly Wonderland is the largest indoor butterfly pavilion in the United States and is home to thousands of butterflies from all over the world. 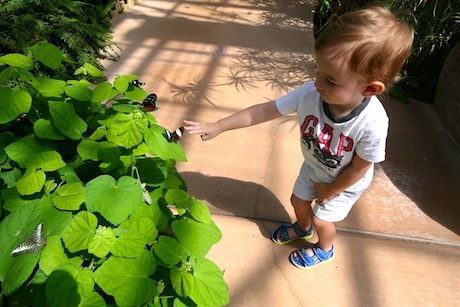 Prior to entering the pavilion, visitors also can see the emergence gallery, where the little creatures are in various states of life, many in metamorphosis. 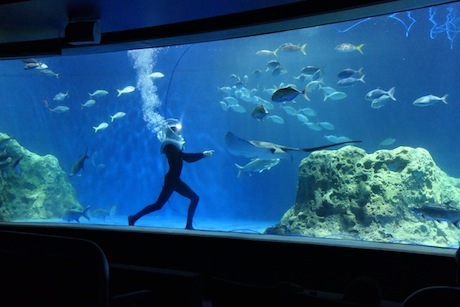 And OdySea is the largest aquarium in the southwest. It features more than 30,000 animals, 50 exhibits and an aquatic presentation, where guests sit in a theatre and rotate around an enormous tank filled with sharks, sea turtles, seals and sea lions. A must-see while in Arizona is the Musical Instruments Museum, which displays more than 6,000 instruments and is the world’s only global instrument museum, with items from 200 countries and territories. The museum is an award-winning Smithsonian Affiliate and guests can see and hear the instruments, as well as watch them being played. Scottsdale has many public parks, such as Cactus Park and McDowell Mountain Ranch Park, where visitors pay a mere $3 per person to be able to use the Olympic-size swimming pools and gym facilities. While being my next-door neighbour is optimal, if you want a personalized tour, the house is often rented, but there are several resorts in the area. Mountain Shadows provides views of Camelback Mountain, offers gym facilities with myriad classes and has an award-winning chef. The hotel restaurant, Hearth 61, an open kitchen concept, has excellent meals, a friendly and helpful wait staff and incredible views. And guests can sign up for a class with photographer Erik Merkow. While Mountain Shadows is a modern resort, it was completely rebuilt from the ground up, and takes the place of a hotel with a Hollywood past, welcoming such stars as Bob Hope and Lucille Ball. Another accommodation option is the Scottsdale Resort, which has a relaxed, charming atmosphere, comfortable rooms, swimming pools and Kitchen West Restaurant, where every meal is delicious. The hotel also has lots of open spaces to walk around and explore, and is a perfect place for a family with kids. The Shabbat before our temporary neighbours returned home, they invited us to come over and spend some time with them. They marveled at Scottsdale and a few of them said they were definitely coming back, as the community had welcomed them with open arms. It was nice to see my hometown through their appreciative eyes, as often we forget to notice in our own community the beauty that surrounds us and the people who lovingly embrace us. We need such reminders every so often. And, sometimes, it’s as simple as rushing out of your house to see a double rainbow and getting a double surprise, making new friends as well. Masada Siegel is a writer living in Scottsdale. Follow her on Twitter @masadasiegel.